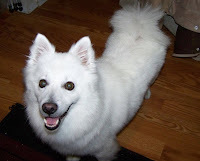 We are watching my mother-in-law's little Spitz-like dog, Myra. Mother in law lives with 2 of her sons. Myra was somewhat mistreated by her previous owner. She is strangely aggressive to one of my brothers-in-law, but is fine with the other. She's fine with me, but that's not unusual--I'm not a dog whisperer, but I'm probably at least a dog mumbler...It is fairly common for me to be petting a dog at the dog park, only to find out that the dog doesn't usually like strangers, or strange men. The theory is that we will keep her for a week or two, bring her to visit MIL and BIL fairly often, and see if we can stop her from snapping at the BIL she doesn't like. It isn't my theory, but she isn't much of a hardship, except that her bark is piercing. Dogs are an excellent judge of character. I like the mix of dogs, rainbows, floors and watch guts.